The first thing I did when I found out that my family was going to my grandparents' house in Williamsburg for Thanksgiving was to find out if there was a race up there that day! And I was so glad to find the Blue Talon Bistro Turkey Trot 5k. It started and ran all through Colonial Williamsburg. We picked up my race packet and shirt the day before. The weather was FREEZING! And with 10 minutes before Target closed the night before the race, I realized that I had left my running gloves and ear warmers in Bella's bag at the people who were dog-sitting her. Ooops! Thankfully, my dad came to the rescue and we rushed to Target with about 3 minutes to spare! The weather in the morning was in the 30's and right before the race started, it started to rain/sleet so everything was slippery. But it was so much fun to run along a course that I visited so many times growing up. I really want to run the half marathon that goes through Colonial Williamsburg one day. 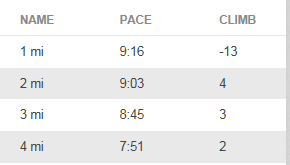 My official time was 27:50, my second fastest 5k race at the time. Not bad! I was 555 out of 1,824 overall, 175th out of 971 for females, and 26th out of 103 for my division. I did a turkey trot too up in NY and it was freezing! I love running through Williamsburg. I just did the 8k up there and thinking about the half marathon next year.